Results: Complex oxides have the potential to inject new functionalities into technologies that require semiconductors. The correlated behavior of itinerant electrons in these materials sets complex oxides apart from traditional semiconductors such as Si and GaAs. Potential applications abound, but the fundamental properties of these materials, particularly when combined to make interfaces, must be understood. 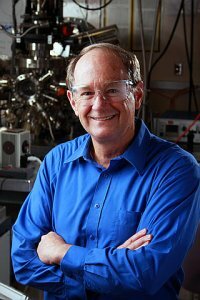 In an invited Perspective article in Surface Science, Dr. Scott Chambers of PNNL examines conductivity at the interface of polar and nonpolar complex oxides from outside the reigning paradigm and considers how unintentional dopants and defects, resulting from interfacial mixing, might affect the electronic properties. The common paradigm used to explain the observation of conductivity at interfaces of materials such as lanthanum aluminate and strontium titanate is that electrons move across the interface to alleviate the so-called polar catastrophe created by polar/nonpolar interface creation. Based on a number of different experimental results, Chambers argues that this simple paradigm is inadequate to explain observed conductivity. "Intermixing occurs, and the resulting cation rearrangement cannot be ignored," said Chambers, a Fellow of the AVS and the American Association for the Advancement of Science. "Moreover, defects and dopants appear to play a role in facilitating, if not enabling conductivity." Why It Matters: Providing insights into the fundamental relationships between composition/structure, and the resulting electronic, magnetic, and surface chemical properties of complex oxides could enable these materials to have an impact on next-generation electronics, chemical sensors, and photocatalysts. These advances could include more energy-efficient field effect transistors and photocatalysts that use visible light from the sun. What's Next: Chambers and his colleagues around the world are continuing to make strides in understanding the complex relationships between atom distributions near the interface and conductivity. One upshot is that significantly more insight into the growth process is necessary to characterize and ultimately control defect creation during heterojunction formation. "Then and only then can interface structures suspected of facilitating conductivity be changed to see if doing so actually reduces or eliminates conductivity," said Chambers. Acknowledgments: This work was supported by the U.S. Department of Energy, Office of Science, Office of Basic Energy Sciences, Materials Sciences and Engineering Division and performed at the U.S. Department of Energy's Environmental Molecular Sciences Laboratory at PNNL. Reference: Chambers SA. 2011. "Understanding the Mechanism of Conductivity at the LaAlO3 and SrTiO3 (001) Interface." Surface Science 605:1133-1140.